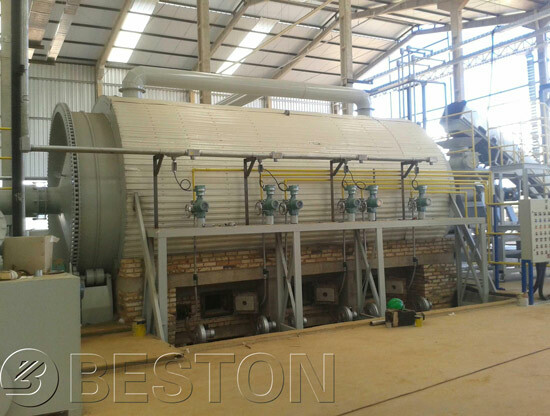 Beston tyre to oil plants are mainly divided into three categories: they are batch type (BLJ-06 and BLJ-10), semi-automatic type (BLJ-16), continuous type (BLL-20). And their daily handling capacities range from 6 to 50 tons. 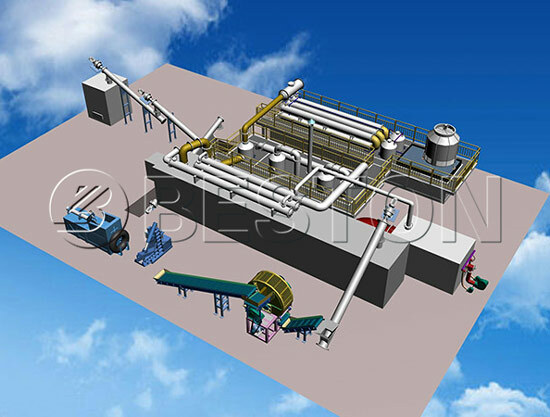 In addition, Both semi-automatic and continuous pyrolysis plant need the tire pre-treatment equipment. Generally speaking, the whole tires should be broken into 30-50 mm rubber pieces by the crusher system to meet the requirement of the spiral feeding device. (According to the investor, it is better to process the tire into rubber particles). 1. 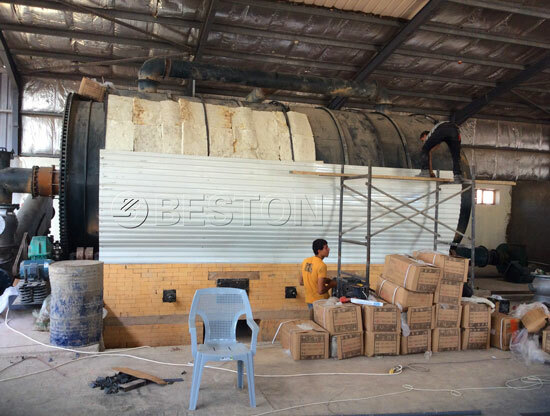 Pre-treated waste tires would be conveyed to the moving horizontal pyrolysis reactor through feeder system, and it starts to pyrolysis and oil gas will be generated when temperature up to 500 degrees. 2. Then the oil gas will be cooling down by spray cooling system, it would be liquefied, go into the oil tank. And at the same time, some un-condensed gas come into hot air circulation heating system by secondary fire retardant damper, it will be recycled for heating reactor as gas material. 3. Exhaust gas go to the strong spray de-dusting system for removing pollution, then let environmental gas go to the air. The pyrolysis slag emissions and recycled through second sealed discharging system. Continuous Feed: the device uses a special structure liquid self-sealing device and gas tight propeller smooth the raw material into continuous stirred tank reactor, the key technology is the “automatic oil return device” in it, which absolutely guarantee that the reactor at high temperature be continuously feed, with materials,but no air. Slag Automation: Continuously slag is a key technology, which is related to the ability of uninterrupted production. Solid and liquid double insurance designed self-sealing slag device guarantee that cut off the air in high temperature conditions to achieve continuous slag. And that is the full sense of the continuous production by feeding, oil discharging, and slag discharging. Full energy saving: This technology makes full use of dry combustible non-condensable gas generated by continuous cleavage to burn, which can meet the basic needs of self-heating, and can greatly reduce production costs. Environmental Emissions: For gas, we use the patent product induced – spray,smoke purifier, which can change black smoke to white smoke, and reach the national standard GB13271-2001.